Muses about music, musicians, and musical interludes of all sorts. Also, chronicling the creation of an album of original songs, by a guy who figures he might as well. Only one real disco song this week - and that was more mood music than anything else. 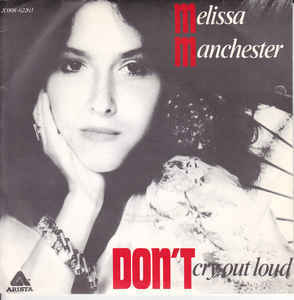 I like Melissa Manchester, and this is a great album – except for the title track, this song, which doesn’t fit it at all. Manchester recorded the album with Leon Ware as producer (Ware had written and produced for Motown, writing “I Wanna Be Where You Are” for Michael Jackson and producing I Want You for Marvin Gaye), writing or cowriting nine out of ten songs herself (the exception being a remake of Stevie Wonder’s “Bad Weather”). But Clive Davis didn’t hear a single, and… their opinions vary from there. Davis (from his autobiography): “Melissa hated both [“Don’t Cry Out Loud” and “You Should Hear How She Talks About You”] with a passion. In fact, Harry Maslin, whom I brought in to produce “Don’t Cry Out Loud” with her, credits Melissa’s anger at having to sing it for the strength of her performance.” Manchester (in a 2015 interview): “[Davis] remembers history his way and I remember history my way. He remembers bringing me “Don’t Cry Out Loud.” I remember being friends with Peter Allen and Carole Bayer Sager and hearing “Don’t Cry Out Loud” as a very quiet song, bringing it to him and saying yes, it’s gorgeous, let’s do it the way Peter did it – as beautiful and quiet. When I showed up in the studio and the cannons blew on this huge version – which turned out beautifully, it turned out as a gift.” Anyway, she received a Grammy nomination for the song. Poco, “Crazy Love,” #17, 3/31/79It only took Poco two labels, ten years, and eleven studio albums before they finally notched a top 40 hit. Rising from the ashes of Buffalo Springfield (original guitarists Richie Furay and Jim Messina had both been members of that band), the band came together on Epic through an odd trade – Furay was signed to Atlantic through Buffalo Springfield, while Graham Nash was signed to Epic through The Hollies, but their new bands (Poco and Crosby, Stills, and Nash) were with the opposite labels, so the two companies negotiated a trade. Anyway, Furay and Messina were long gone from Poco by 1979 – the only original member left was pedal steel player Rusty Young, who wrote and sang “Crazy Love.” Released on ABC Records just as the label was being absorbed by MCA, the song and album defied all odds and became Poco’s biggest hits. Instrumentals were becoming less frequently found on the charts in the late 1970s, but they still popped up now and then. This was Moroder’s second chart hit; his first, “Son of My Father,” had made #46 in 1972. In the intervening years, Moroder had become better known as a songwriter and producer with and for Donna Summer (he’s also worked with Elton John, Blondie, and other acts). This song comes from the film Midnight Express and can be found on that soundtrack album. I doubt it got a lot of Top 40 airplay, but it was also released as a disco single and charted in the United Kingdom. Second chart hit from Toto’s debut album. Eight of the ten songs on the album were written by keyboard player David Paich (son of producer and arranger Marty Paich, who worked with Frank Sinatra, Aretha Franklin, Barbra Streisand, and Stan Kenton, and was the orchestra leader for the variety shows The Glen Campbell Goodtime Hour and The Sonny and Cher Comedy Hour), this was sung by Bobby Kimball, who was the band’s full-time lead singer for their first four albums and again from 1999 to 2008. The video comes complete with some cheesey late 1970s effects and an animated intro. Second and final album by the band formerly known as Bachman-Turner Overdrive; the name change was necessitated by founder Randy Bachman’s departure (although brother Robbie was still with the group). Not surprisingly, BTO without Bachman (who had previously helmed The Guess Who with Burton Cummings) didn’t generate a lot of interest, and this was their one American Hot 100 entry (the song did better in their native Canada). The parent album for “Heartaches,” Rock ‘n’ Roll Nights, was produced by Jim Vallance, who also wrote several songs for the album (his future songwriting partner, Bryan Adams, also wrote one song). Judy Collins, “Hard Times for Lovers,” #61, 3/31/79Collins’ final pop singles entry (she scored 11 hits overall on the Billboard Hot 100, including “Send in the Clowns” twice), this was a take on couples’ inability to stay together, and came from the album of the same name. Collins probably wasn’t in the best frame of mind when the album was recorded – she had just been through alcohol rehab, and was still struggling with bulimia (she would conquer that a few years later); the fact that the album is completely out of print may reflect this. Collins still records, and toured in 2017 with Stephen Stills (who wrote “Suite: Judy Blue Eyes” for her; it appears on Crosby, Stills & Nash’s first album). This isn’t a great video (it’s live at the Capitol Theatre in Passaic, NJ around the time of the song’s release, and it’s in black and white), but it’s interesting to see a performance video from that era. English rock band that recorded two albums for Ariola Records (not to be confused with Arista Records) in the late 1970s; this would be their one and only chart hit. The band had turned over almost completely between their first album release in 1977 and their second, Partners in Crime (not to be confused with Rupert Holmes’ 1979 album of the same name); only Danny McIntosh remained from the first group. Bass player Tony Lester wrote most of the album’s songs. McIntosh is now guitarist for Kate Bush, and has been married to her since 1992. Disco at the top and the bottom of this week's chart, but not in the middle. The second single from their Spirits Having Flown album was just as successful as the first, becoming their fifth consecutive number one hit in the United States. It hit the top in seven countries overall and went top 10 in many more (apparently only Japan was disinterested; it peaked there at #32). The Gibb brothers wrote the song during a day off from filming the movie Sgt. Pepper’s Lonely Hearts Club Band (so something good came out of that film); they knocked off this one and “Too Much Heaven” during the day and Andy Gibb’s “Shadow Dancing” that evening. And what have I done so far today? Well, I’ve written this paragraph. 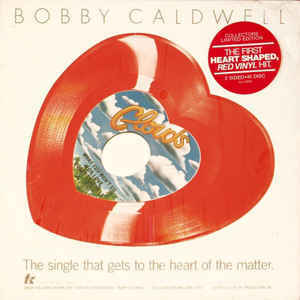 The first single from Caldwell’s eponymous debut album became his one and only top 40 hit as a recording artist. Bobby Caldwell only showed a picture of him on the album cover in silhouette; the feeling was at Clouds Records (a subsidiary of TK Records, home of KC & The Sunshine Band and other bands that appealed primarily to African-American listeners) that Caldwell would have more appeal if it wasn’t well known he was white (which, of course, was dispelled the moment he started touring and appearing on television). Clouds also released a heart-shaped red vinyl single as a promotion for radio stations and later did a commercial rerelease for Valentine’s Day. The single sleeve (shown above) is misleading; there’s no way one can play a vinyl record with grooves that aren’t round (there are plenty of YouTube videos showing the disc being spun). And anybody who paid $7.98 for that heart-shaped single is nuts (I know my copy went for considerably less than that). Second hit from Joel’s 52nd Street album, where it’s the lead cut. It’s a rocker about someone who embarrasses himself in public after too much drugs and alcohol. The only question is who the song’s about – and Joel has told two different stories in that regard. In a 1996 Q&A session (which is on his web site), he says it’s both about himself and a close friend, noting “Well, I did a lot of research for this song, obviously.” He’s also noted the song was not about a date he’d had with Bianca Jagger, but later told Howard Stern he’d met both Bianca and Mick (presumably while they were still married), and had considered what it would be like for Mick to write a song for her when he wrote this. I’m not sure what to make of that. This was Diamond’s second chart hit from his You Don’t Bring Me Flowers album (and, admittedly, wasn’t as big a deal as the title track). Cowritten by Diamond and guitarist Richard Bennett, it’s not one of his best – first verse, second verse, bridge, repeat first verse, repeat second verse, repeat bridge, repeat first verse – but it seems to have struck a chord with his fans. Produced by Bob Gaudio, who was an original member of The Four Seasons and wrote several of their hit songs. A huge hit for Rabbitt, which came from the Every Which Way But Loose soundtrack (remember the movie with Clint Eastwood and an orangutan?). This would be the third of four consecutive country #1 hits for Rabbitt, who would rack up 14 chart-toppers on the Country chart overall; it was also his first top 40 hit on the pop charts. Rabbitt customarily wrote his own material, but this song was cowritten by Milton Brown, Steve Dorff (who wrote Kenny Rogers’ “Through the Years,” cowrote “I Just Fall in Love Again” for Anne Murray, and wrote the theme to the television series Growing Pains), and Snuff Garrett (who had produced #1 hits for Sonny & Cher and Vicki Lawrence). That’s a cheap way to get a hit – this was the B-side of Clapton’s top 10 hit “Promises,” and apparently it got enough airplay to hit the Billboard Hot 100 separately. Which is odd – Billboard had listed A-sides and B-sides of singles separately through most of the 1960s, then started listing them together in 1969 (The Beatles “Come Together/Something” and a number of Creedence Clearwater Revival songs were listed on the chart in this manner). Apparently the editors there changed their minds at a point where it didn’t make a whole lot of difference; two sided hits were pretty rare by the end of the 1970s (although there was one later in the year). Desmond Child & Rouge, “Our Love Is Insane,” #51, 3/24/79This would be the first and only hit for this pop/disco vocal group, most of whom would become more famous for what they did after the group broke up. Maria Vidal would have a top 10 dance hit with “Body Rock” in 1984, which was the theme to the movie of the same name. Child became a major force in songwriting and producing, writing top 20 hits with and for Kiss (“I Was Made for Loving You”), Cher (“We All Sleep Alone,” “Just Like Jesse James”), Bon Jovi (“You Give Love a Bad Name, “Livin’ on a Prayer”), Aerosmith (“Angel,” “Dude (Looks Like a Lady),” “What It Takes”), Alice Cooper, Joan Jett, Michael Bolton, and many more. Another of the many disco groups that came and went in the late 1970s. Arpeggio released two albums on Polydor Records, Let the Music Play (also known as Love and Desire; I don’t know whether Polydor retitled it or if different countries used different names) in 1978 and Breakout in 1980; this came from the first album. The song hit the top 10 on the Billboard Disco chart as part of Let the Music Play (“all cuts” are listed on the chart, which means club DJs were playing everything, I guess). Produced by British Northern Soul producer Simon Soussan. The background for this band is more interesting than the song, which appears to be standard soft rock. They started out as a teen four-piece band, Blackfoot Sue, and had a top five hit in the UK with “Standing in the Road” in 1972. Nothing else hit quite so well, however, so they dropped one member, reinvented themselves as Liner in the late 1970s, and got a contract with Atco Records (an Atlantic sublabel) in the United States. Billboard’s review is as mushy as it gets: “Lots of mainstream pop and disco influences are in evidence here, although these newcomers are an English trio who seem better equipped to rock than spin the Bee Gees/Barry White riffs that make up this debut outing. Nevertheless, there’s something about these 10 cuts that suggests the band is capable of turning out commercially viable tunes with appeal beyond the disco market. Only time will tell… The young and trendy may dig this derivative sound.” Way to go out on a limb, guys. Anyway, they later became Outside Edge, then went back to Blackfoot Sue again, and apparently last made an appearance together in 2013. THE MATTERMORES: The End of Racism! Happy birthday Doktor Einstein. Yes, there is a song. "The Ultimate UNAUTHORIZED Beatles Book!"